SOAPware DocumentationSOAPware FAQ'sFAQ's MiscellaneousQ: What are document demographics? A: The document demographics section is located in most chart sections, separated from the document by the upper splitter bar. The upper splitter bar may be expanded or collapsed, to view the document demographics. Demographic information can vary from one chart section to another. 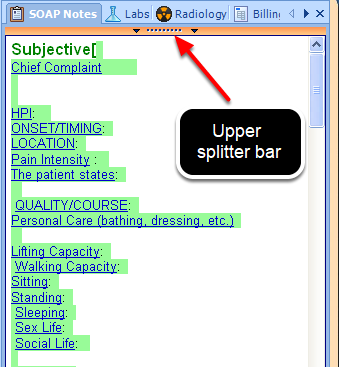 Click the upper splitter bar to view document demographic information for the SOAP Note chart section. The image above displays document demographic information for the SOAP Note chart section. To close/hide the document demographics, Click the upper splitter bar. Previous Lesson: Q: How do I remove a document? Next Lesson: Q: Why is my patients chart empty?